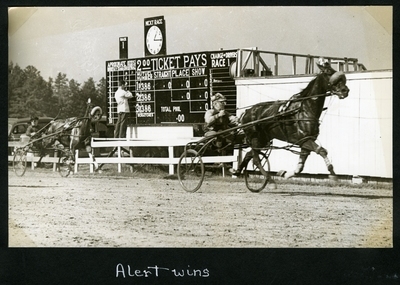 Black and white action photo of the finish of the first heat of the 2.15 Pace at the West Oxford Agricultural Society Race on Friday, October 6, 1939 at Fryeburg, Maine. Bay gelding, Alert, wearing head number two, Hanafin up finished in first place. Bay mare, Louise Scott finished in a distant second, Phalen up. Black gelding, Star Gale, Church up, finished in third.